Are you ready for some football? The Pats will face the Rams on Sunday, February 3rd at 6:30pm in Atlanta. Thinking about hosting a little (or big) Pats’ Super Bowl bash? Here are some tips to host a super terrific party with a little help from Dot businesses! Molinari’s – From wings to meatballs (and of course amazing pizza), check out Molinari’s catering menu for you Super Bowl Party! Small trays serve 8-10 people. Large trays serve 12-16. Catering orders require 48 hour notice. Check out their full menu here! Pat’s Pizza and Catering – Serve up a tray of sandwiches to your football fans! From homemade chicken salad to roast turkey with stuffing and cranberry sauce, Pat’s offers sandwiches by the dozen (2 dozen minimum) as well as deli platters. Visit their website for more information! Guac on! Yellow Door Taqueria is making Super Bowl Sunday even better with TACO TAKEOUT. Featuring two Game Day packages to chow down while rooting for the Patriots! All orders must be placed online by Friday, February 1st at 5PM and picked-up by kickoff on Sunday, February 3rd. 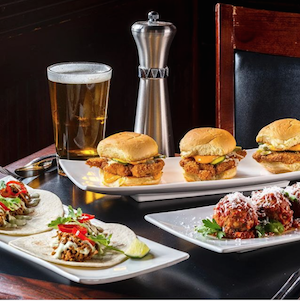 Lucy’s American Tavern has two different Superbowl packages available for takeout: “Do Your Job” feeds 8-12 people – 24 Dry Rub or House Hot Wings, 1 rack of Ribs, Mac N Cheese, and choice of Charred Artichoke & Jalapeno Dip or Buffalo Dip. – $80 and “We Ain’t Going Nowhere” feeds 15-20 people – 48 Dry Rub or House Hot Wings, 2 racks of Ribs, Large Mac N Cheese, Charred Artichoke Dip and Buffalo Dip – $150. You can add one pulled pork, burnt ends or chili for $21 each. Lucy’s is also doing wing orders as well with our Dry Rub or House Hot wings – 40 for $50 or 80 for $100. Bred Gourmet is bringing its wing game for your party. Enjoy a half-tray of wings for $45, a full tray for $80. Pick from Buffalo, jerk BBQ, lemon pepper, cajun or house flavors. Place your order today! Spice things up! Check out Shanti for some authentic Indian dishes including Chicken Tikka and fresh baked Naan. Or order from Pho Hoa for a wide variety of Vietnamese specialties like their spring roll tasting platter! Cake Pops Boston – Don’t forget about dessert! Cake Pops in Lower Mills has fun and delicious Patriots and Football cake pops for your guests to enjoy! Prices start at $30 per dozen and come in flavors like chocolate, vanilla, cookies and cream, red velvet and more! Check out their website here! Chill on Park – I scream! You scream! We all scream for Ice Cream! How about serve up a Make Your Own Super Bowl Sundae Bar to your guests! Chill on Park has all the fixings to make your party extra sweet and fun! Dorset Hall – Dorset Hall has a special Super Bowl House Party Catering Menu featuring game watching snacks like chicken wings, sliders, rib & more! You can check out their menu here! All orders must be placed by Thursday, January 31st!!! Please contact Erica at info@dorsethall.com to place your orders ASAP, as only limited orders will be taken. Orders must be paid in advance and pickup time is required.